A Bronsted Acid provides a proton to an electron donor. In doing so, the former Bronsted acid becomes a conjugate base. We can understand a great deal about proton transfer by looking at that conjugate base. If the conjugate base is not very stable, then probably the proton will not be donated. If the conjugate base is very stable, then the proton may be given up more easily. The first factor to consider is that atom attached to the proton in the Bronsted acid. That is the atom that will accept a pair of electrons from the covalent bond it shares with the proton. How easily can this atom accept a pair of electrons? An obvious factor to consider is electronegativity. As the atom attached to the proton becomes more electronegative, the bonding pair of electrons becomes more strongly attracted to that atom, and less attracted to the proton. If the bond becomes more polarized away from the proton, it seems likely that the proton will more easily ionize. The molecule containing this bond will be a stronger Bronsted acid. It will not hold onto the proton as tightly. It will have a lower pKa. In addition, we should think about what happens after the proton has ionized. In most cases, a neutral (uncharged) Bronsted acid will give rise to an anionic conjugate base. Proton transfer is generally reversible, so it could always go back where it came from, unless something stabilizes the anion that forms. However, if an atom has a higher nuclear core charge, it will be more stable as an anion than would other atoms. That means a compound with a hydrogen attached to that atom will give up a proton more easily. When we consider anion stabilities, the trend across a row of the periodic table is exactly the same as the trend in bond polarity. Figure AB11.1. Variation in Bronsted acidity across a row in the periodic table. In each case, choose the compound more likely to act as a proton donor. The atom attached to the proton influences the acidity in other ways. Whether or not that atom has a formal charge becomes very important. The reason is simple: when a proton is given up, the proton will have a positive charge, and the atom releasing the proton will become more negative. Consequently, if the atom attached to the proton already has a negative charge, it is less likely to give up the proton. If it did, it would take on a charge of 2-. That charge build-up would not be very favourable. On the other hand, if the same kind of atom had a positive charge, it would be much more likely to give up a proton. Once it did, it would have no charge at all. That would be pretty favourable; no energy would have to be expended in stabilizing a charge that is no longer there. As an example, consider three related species: water (H2O), hydroxide ion (HO-), and hydronium ion (H3O+). Of the three, the hydronium ion would be the most likely to donate a proton, in order to relieve the oxygen atom of positive charge. Charge stabilisation costs energy, so having no charge at all is often better than having a charge. The hydroxide ion would be least likely to give up a proton, because that would leave an oxide ion with a charge of 2-. That increase in negative charge on one atom costs energy. The water ion would be intermediate. There would be an increase in charge on the atom, but it wouldn't be the same as a build up of a 2- charge on the atom. In other words, hydronium ion is more acidic than water, and water is more acidic than hydroxide ion. Of course, these general rules about acidity do not always apply in different situations. We know that halogens tend to be pretty stable as anions, for the most part, so their anionic form may be more stable than their neutral form. Conversely, positive metal ions may be more stable than the corresponding neutral atom. In the specific case of how likely an atom is to give up a proton, however, the development of charge or loss of charge does become an important factor. This factor is especially important when we are comparing two atoms of the same type, such as two oxygen atoms or two nitrogen atoms. In each case, assess whether a formal charge is present. Choose the compound more likely to act as a proton donor. Figure AB11.2. Variation in Bronsted acidity down a column in the periodic table. Bond strengths actually vary in this way indirectly because of the relative electronegativities of the halogens. The valence electrons on fluorine, a more electronegative atom, are at a lower energy than those on either bromine or chlorine. When the valence electrons on a hydrogen atom and a halogen atom combine to form a bond, the bonding combination is at a lower energy than either of the originals. Of course, the antibonding combination is at a higher energy than either of the originals, but since there are no electrons at that level we don't have to worry about that. What is a bond strength? It's just the amount of stabilisation upon formation of the bond. Put in an allegorical way, it's how deep the gully is that the electrons have rolled into when the bond forms. To break the bond, the electrons would have to climb the hills back out of the gully again. For example, the bond strength of HBr involves the amount of energy by which the electron on hydrogen has fallen, ΔE1, plus the amount by which the hydrogen on bromine has fallen, ΔE2. To break the bond again, we would have to add in the sum of ΔE1 + ΔE2. The analogous amount for HCl is greater, mostly because ΔE1 in that case is much larger, and it is even greater for HF. Thus, bond strengths vary in the order HF > HCl > HBr. While we are looking at that picture, it's worth considering another common aspect of bond strengths. As a simple approximation, there are two important components that describe a bond. One component is overlap (how well the eletrons are shared; that is, how covalent is the bond). The other component is exchange (how much electrostatic attraction there is between the atoms; that is, how polar is the bond). 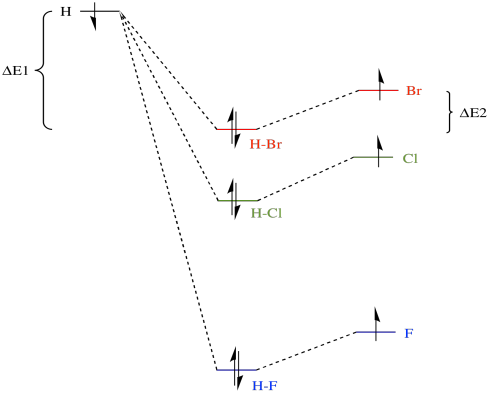 In fact, bromine is better at sharing its electrons with hydrogen than is fluorine, but the H-F bond is more polar than the H-Br bond. The latter fact is another consequence of fluorine's electronegativity. Once again, the greater electronegativity of fluorine actually leads to a stronger bond in this case. Now, in summary, we need to think about both sides of the equation. The H-F bond is the strongest; that is, it is lowest in energy. However, upon ionisation, bromide is the most stable anion, because it is the largest and most polarisable. Overall, the reaction from HBr to bromide is the most downhill in energy; that one will happen most easily. In contrast, the reaction from HF to fluoride is actually uphill in energy; that one will be most difficult to ionise. The argument is sometimes made that this difference results from the molecular orbitals that must be used for formation of the C-H bonds in these complexes. In ethyne, which has linear carbons, bonding to the neighbouring atoms could involve only two atomic orbitals from the carbon, based on geometric considerations. The 2s orbital could contribute to electron sharing; because s orbitals are spherically symmetric, they can bond equally well in all directions. One of the 2p orbitals could also contribute. However, the other two p orbitals cannot be involved, because they are both perpendicular to the first p orbital. If one p orbital lies along the C-H bond axis, the other two are completely orthogonal to it. For that reason, a linear carbon is sometimes called an sp carbon, describing the atomic orbitals that can participate in sigma bond formation with neighbours that lie along a straight line. In ethane, which has tetrahedral carbons, a similar argument is made. The difference is that a tetrahedron is a three-dimensional shape. The s orbital can still bond to neighbours in any direction because of its spherical symmetry. However, in order to bond with neighbours in all three dimensions, the entire set of p orbitals would be needed, because each p orbital lies along one dimension only.